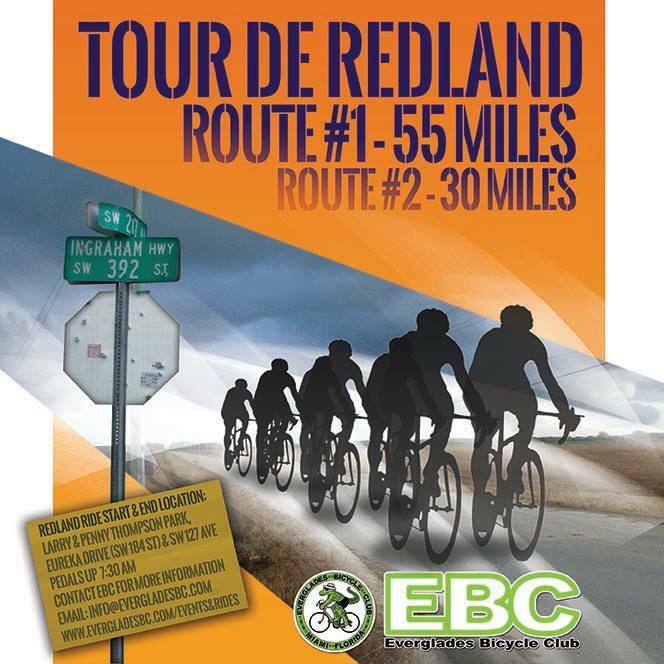 Join the Everglades Bicycle Club for the Tour de Redlands, a free outreach ride tracing the routes used by EBC in the 1970's. They'll depart from Larry and Penny Thompson Park at 7:30 AM. The fast group will go down to Robert Is Here for a 55 mile ride. A slower paced 30 mile ride will set off to R.F. Orchids and through Cauley Square. The Tour de Redland is a meetup community ride. It is an unsupported ride with no ride leaders. Riders must wear helmets and bring hydration. It is not a sanctioned ride. There are no rest stops, there is no SAG, and the roads will not be marked. You participate with the agreement that you assume your own risk, like any other group ride.